There's nothing new about getting your nails done for your wedding. But what is new is the amazing array of techniques and effects available. And the best bit it you don't have to be a professional to get them. There are plenty of ideas to do yourself, and its easy to test them out before the big day. 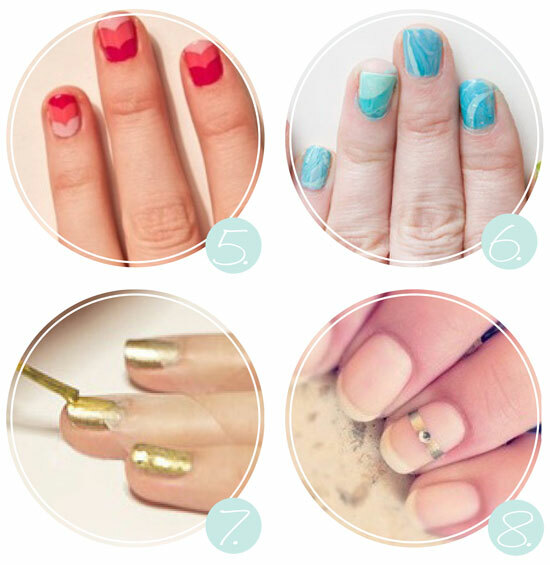 So get the girls together and try some of our favourite nail art wedding looks. Nothing says luxury like caviar, right? But if you cant afford it on the menu don't despair, you can have it on your nails. Ciaté have a nail polish specifically for the caviar look and it even comes in white. It's not available in Australia yet, so try ebay or ASOS. Fashion Workshop also has a photo step by step to get the same look using Recollections Micro Beads. Add a little lace with this really simple technique from Some Sweet Little Dreams. Just a base coat and some white nail polish. We've shown you how to get a beautiful gradient effect on your nails before here. The ombre trend is still huge and still really easy to achieve. Glamour has a great step by step to follow. Anyone can grab a bottle of glitter nail polish, but how about this for a gorgeous alternative - ombre glitter dipped nails. Pick a base coat then go over just the tip, or just the base, of your nails with a complimentary glitter. Check out Minkette for their beautiful in-depth tutorial. Who could resist little love hearts. Just three shades of pink and some paper ring correctors - you remember those weird little polo mint looking stickers, finally a use for them. You can achieve some pretty bold and crazy looks with marbled nails, but for a more subtle look on your wedding day just choose two softer complimentary shades. Head over to ModCloth Blog for a tutorial. Mixed metals. Follow fashions trend of mixing patterns and texture and do the same with your nails, but try The Beauty Departments metal magic. And finally, the ring finger - just a totally adorable idea really. Via Pinterest.